It was very interesting to hear about the great work that all the organisations are doing that attended the Devizes Rotary Half Year Review earlier this month, and even more satisfying to hear how much they enjoyed listening and talking to each other about their respective work. Below are some examples of written comments that we’ve received. “Many thanks again for the Rotarians’ ongoing support, particularly you and your work with the Devizes DAA. “Just a few lines for say thank you so much for the cheque that Devizes Rotarians gave to Sheila Ashley. It was very kind of you. I can assure you that all donations are gratefully received and all monies put to very good use. Alzheimer’s Support rely heavily on people’s generosity and without this would struggle to survive. 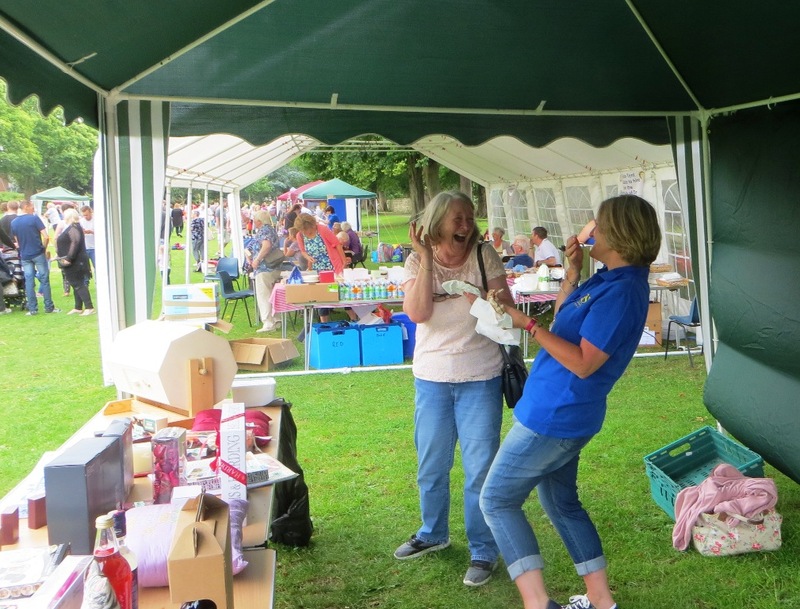 The Devizes Rotary food team were in action again earlier this month at Trowbridge Park where we served up lots of roast potatoes in cones to crowds attending the Alzheimer Support Fun Day. The inaugural event was first scheduled to take place in May but had to be postponed due to bad weather. However the sun shone down in abundance this time and we had many visitors to the stall including Linda Self, mayor of Trowbridge, and John Craig who was the show’s compere. This was also the inaugural outing for the club’s marquee, which behaved impeccably when it was loaned to the event organisers to use as their refreshments tent. 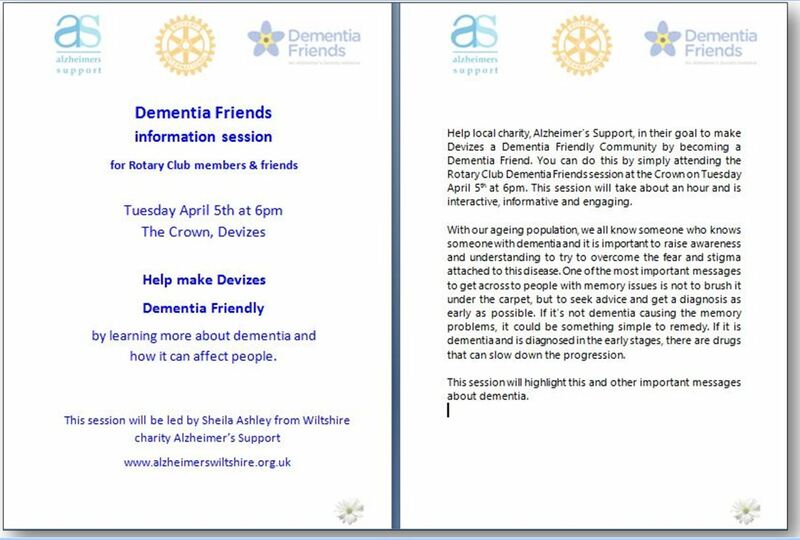 Yesterday evening we were fortunate to have Sheila Ashley from the Alzheimer’s Support charity come and talk to us about how to become Dementia Friends. The session was highly informative and kept us on our toes with exercises designed to help us better understand and appreciate the affects Alzheimers on everyone involved. At the end of the evening we were all given the option to complete a form indicating what action we will take to help make a Devizes a Dementia Friendly Community.